a baglike organ or structure; see also bag, pocket, and pouch. air s's (alveolar s's) the spaces into which the alveolar ducts open distally, and with which the alveoli communicate; see also lung. amniotic sac the sac formed by the amnion, enclosing the fetus suspended in amniotic fluid; popularly known as the bag of waters. conjunctival sac the potential space, lined by conjunctiva, between the eyelids and the eyeball. endolymphatic sac the blind, flattened cerebral end of the endolymphatic duct. hernial sac the peritoneal pouch that encloses protruding intestine. lacrimal sac the dilated upper end of the nasolacrimal duct; see also lacrimal apparatus. yolk sac the extraembryonic membrane connected with the midgut; in vertebrates below true mammals, it contains a yolk mass. 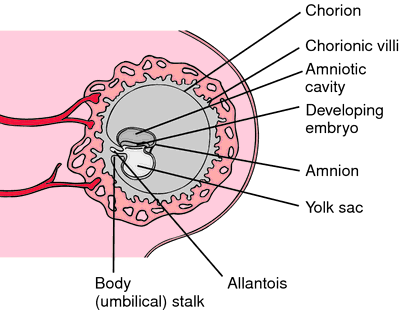 Yolk sac in a developing embryo. From Applegate, 2000. 2. in humans and other mammals, the sac of extraembryonic membrane that is located ventral to the embryonic disk and, after formation of the gut tube, is connected to the midgut; by the second month of development, this connection has become the narrow yolk stalk; the yolk sac is the first hematopoietic organ of the embryo, and its vitelline circulation plays an important role in the early embryonic circulation; the sac is also the site of origin of the primordial germ cells. a structure that develops in the inner cell mass of the embryo and expands into a vesicle with a thick part that becomes the primitive gut and a thin part that grows into the cavity of the chorion. The cells of the extraembryonic mesoderm differentiate to develop endothelium, primitive blood plasma, and hemoglobin. The yolk sac usually disappears during the seventh week of pregnancy. See also allantois, Meckel's diverticulum. A saclike structure formed from the exocelomic cavity of a blastocyst. A tiny bag attached to the embryo that provides early nourishment before the PLACENTA is formed. the sac-like structure that contains YOLK and is in direct contact with the gut of embryos in fish, reptiles and birds. Though present in mammalian embryos, it does not contain yolk but absorbs uterine secretions until the PLACENTA (1) becomes functional. one of the extraembryonic fetal membranes that balloons out from the fetal midgut. It helps to form a primitive placenta and promotes the development of the vitelline circulation. The vestigial yolk sac can be found about halfway along the small intestine of birds. The yolk sac membrane produces lymphoid stem cells that subsequently colonize the thymus and bursa of Fabricius. The stalk of the yolk sac is sometimes retained as Meckel's diverticulum of the small intestine. a form of placentation in which fetal splanchnic mesoderm in direct contact with maternal uterine tissue; occurs in laboratory rodents. Called also yolk sac placenta. see inverted yolk sac (above). shows varying stages of differentiation into tissues of multiple germ layers. Called also endodermal sinus tumor. 1) From 0 (newly hatched) to 2 DAH: Yolk sac is big and spherical, digestive system is not completely developed, heart appeared and is beating. The internal yolk sac became exhausted 10-20 days after hatching and juveniles showed less interest in the zooplankton diet (day 50); by day 54, they fed and readily captured ~4-5-mm (total length) C.
Although yolk sacs were larger in larvae that hatched precociously, there was no evidence of the yolk-sac or cardiac edema that is seen in embryos exposed to polycyclic aromatic hydrocarbons (Vines et al. In metatherian mammals, it is the yolk sac that serves this function. Embryologically, haematopoietic stem cells arise in the yolk sac and many M-NSGCTs contain yolk sac elements. It showed their offspring standing over a ball - the nutrition providing yolk sac - while preparing to take a penalty kick. In normal pregnancies, a gestational sac is seen on TVUS between 4 and 5 weeks' gestation; (29) the yolk sac is visible at around 6 weeks; and an embryo can be detected between 6 and 7 weeks. To determine if SARS-CoV could grow in avian embryos, 9-day-old chicken eggs and 13-day-old turkey embryonating eggs were inoculated by allantoic sac route and 17-day embryonating turkey eggs were inoculated by yolk sac route; all were tested by virus isolation and real-time RT-PCR for SARS-CoV. The first patients in the registry include 17 survivors of lymphoma, 8 survivors of sarcoma, 5 survivors of Wilm's tumor, 4 survivors of neuroblastoma, and 1 survivor each of hepatoblastoma, ovarian germ cell tumor, yolk sac carcinoma, and Triton tumor. In one group of species, described as oviparous, the females lay horny egg cases, each containing an embryo nourished by a yolk sac. It feeds by absorbing nutrients from the egg's yolk sac through its belly.